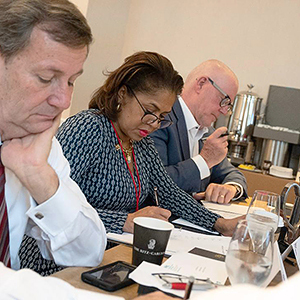 The event — which was sold out this year — returned to Philadelphia to again tackle issues surrounding diversity and inclusion, discussing not only problems, but solutions in the workplace, the marketplace and in the global community. 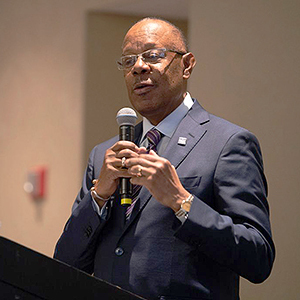 The two-day summit — which was held at the Ritz-Carlton Philadelphia — centered around the theme, “Where Diversity and Inclusion Intersects with Academic and Corporate Strategies.” Over 350 people were in attendance. The summit began with a series of roundtable discussions. One was an exclusive city mayors’ roundtable entitled “Diverse and Welcoming Cities” featuring former Mayor Doug Palmer of Trenton, New Jersey, Mayor Hardie Davis of Augusta, Georgia, and former Mayor Stephanie Rawlings-Blake of Baltimore, Maryland. 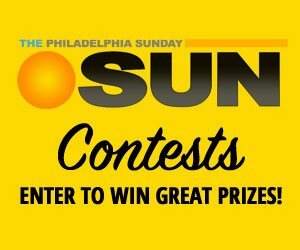 Harold Epps, the City of Philadelphia’s director of commerce, served as a moderator. Diverse and Welcoming Cities roundtable discussion moderator Harold Epps. The mayors addressed topics ranging from the responsibilities of sanctuary cities to gentrification and STEM opportunities for minority job-seekers. “Welcoming cities are defined by the principals of inclusion and created communities that prosper because everyone feels welcome, including immigrants and refugees,” Epps read from a statement at the beginning of the session. The panelists were then asked to give their own definitions of what a welcoming city is to them. Tiffenia Archie, Ph.D facilitating the Academic Think Tank at the 2019 D&I conference. Like many of the older industrial cities in the Northeast Corridor, the population of Trenton has been steadily decreasing, and its ethnic makeup has shifted in the process, Palmer told the attendees. In this regard, becoming a welcoming city is an asset. On the topic of gentrification — which can be a lightning rod issue between long-term residents, developers and newer, younger residents — each participant outlined their individual cities’ approach. Cities must be visionary and open to the newer generation of residents and modern businesses that are moving in, and to what their needs are, Rawlings-Blake said. “If you don’t have a city that welcomes diversity, that welcomes communities other that the ones that are already there, you’re not going to get all of the benefits,” she said. All of the mayors spoke of the upside of introducing mixed income housing . There were also several think tanks on offer for attendees. An academic think tank led by Dr. Debra Blair, associate professor at Temple University’s School of Sport, Tourism and Hospitality Management (STHM), aimed at exploring best practices for incorporating diversity and inclusion content into academic programs and curricula. 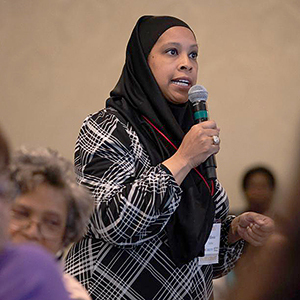 One objective was to share program strategies that provided comprehensive quality experiences for students of color, and the impact of diversity and inclusion on faculty recruitment and retention. There was also an array of informative panel discussions featuring key leaders in healthcare, tech, supplier diversity, education, travel and hospitality, such as Justin Nelson, co-founder and president, NGLCC; Ed McNeill, Lodging Media; Glady Lopez, senior manager, Hilton; Yasmine Mustafa, CEO, Roar For Good, and Hitesh Patel, chairman of the Asian American Hotel Owners Association (AAHOA). At the conference awards dinner, the first-ever Diversity and Inclusion Award from Lodging Media was presented to Norman K. Jenkins, the president of Capstone Development, for his commitment and contributions to diversity and inclusion practices during his career in finance and hospitality. Capstone Development acquires full-service and select-service hotels in the top 25 metropolitan areas in the United States. 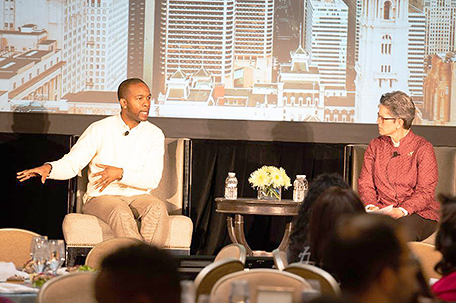 The conference concluded with a closing luncheon featuring an insightful armchair conversation between Patricia Lee, senior vice president of organizational development and chief CSR officer, Wyndham Hotel and Resorts and Wade Davis, former NFL player, corporate inclusion advisor and educator. This year’s conference sponsors included: Temple University, Temple University School of Sport, Tourism and Hospitality Management, the Philadelphia Convention and Visitors Bureau (PHLCVB), PHL Diversity Lodging Media, Temple University’s Fox School of Business, Cheyney University, Destinations International, Global Philadelphia, Jackson Lewis P.C., the Kimmel Center for the Performing Arts, Montgomery Community College, the Pennsylvania Convention Center, the Pennsylvania Restaurant & Lodging Association, the Philadelphia Phillies, Thomas Jefferson University, the Valley Forge Tourism and Convention Board, VisitPhiladelphia.com and WeWork. Proceeds from the conference and dinner will go towards the development of a D&I-focused scholarship for students at Temple University’s School of Sport, Tourism and Hospitality Management.